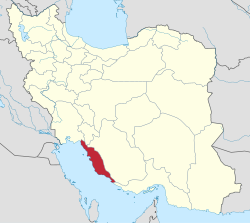 Bushehr Province (Persian: استان بوشهر‎, Ostān-e Būshehr ) is one of the 31 provinces of Iran. It is in the south of the country, with a long coastline onto the Persian Gulf. Its center is Bushehr, the provincial capital. The province has ten counties: Asaluyeh, Bushehr, Dashtestan, Dashti, Deyr, Deylam, Jam, Kangan, Ganaveh and Tangestan. In 2011, the province had a population of approximately 1 million people. The Greeks knew of Bushehr by Mezambria during the battles of Nearchus. A French excavating team however in 1913 determined the origin of Bushehr to date back to the Elamite Empire. A city there, known as Lyan, contained a temple that was designed to protect the compound from naval attacks. Its remains can still be seen today 10 kilometers south of the present city of Bushehr. Marco Polo describes this region as part of the Persian province of Shabankareh. It contains the village of Saba, Iran where are buried (he was told) the three Magi which visited the Christ Child. A key turning point in the history of Bor event of significance is known to have taken place in this region until the arrival of the European colonialists in the 16th century. The Portuguese, invaded the city of Bushehr in 1506 and remained there until Shah Abbas Safavi defeated and liberated the Persian Gulf region of their presence. By 1734, Bushehr had once again risen to prominence due to Nader Shah of the Afsharid dynasty, and his military policies in The Persian Gulf. Bushehr was selected by Nader to be the central base of Nader's Naval fleet in the Persian Gulf. He thus changed the name of the city to Bandar e Naderiyeh (Nader's Port). He hired an Englishman by the name of John Elton to help build his fleet. Dutch accounts report his naval fleet to have amounted to 8000-10000 personnel as well as several ship construction installations. After Nader's death, the Dutch continued to have good commercial relations in Bushehr, until the British made their debut in Bushehr in 1763 by a contract they signed with Karim Khan of the Zand dynasty. By then, the city of Bushehr had become Iran's major port city in the Persian Gulf. By the Qajar era, Britain, Norway, Russia, Italy, France, Germany, and the Ottomans had diplomatic and commercial offices there, with Britain steadily gaining a foothold in the area. Close to 100 British ships are reported to have docked at the port city every year during the Qajar era. A strong earthquake measuring 6.1 on the Richter magnitude scale struck the town of Shonbeh and villages of Shonbeh and Tasuj District in Dashti County of Bushehr Province on 9 April 2013, killing at least 37 people. The coast in Bushehr by the Persian Gulf. During the Iran-Iraq war, Iran's major petroleum exporting ports in Khuzestan sustained damages so severe that a second port in Kharg Island was selected to carry on the major responsibility of Iran's petroleum exports, though even Kharg was not immune from Iraqi air raids. The Bushehr Light water PWR Nuclear Reactor, designed by Siemens AG, built by the Russians, is Iran's first Nuclear Power Plant reactor. As many as 70,000 foreign engineers and technicians are currently working in this industrial zone 270 kilometers south of the provincial capital. This zone is where the nearby famous South Pars Gas field is located, where Iran has invested hundreds of millions of dollars in infrastructure. The South Pars Gas field is the world's largest natural gas field. The Assalouyeh industrial zone is deemed so lucrative that even American companies such as American Allied International Corp and Halliburton have bypassed American sanctions to become somehow involved in the zone. Football is the most popular sports in Boushehr. Boushehr is home to a famous football team: Shahin-e Boushehr (Pars-e Jonoubi). Shahin is one of the oldest soccer team in Iran which has found in 1942. Shahin is one of the most popular teams in current Iranian football league just like Tractor-Sazi from Tabriz. The ancient site of Ray-Shahr which is located 8 km south of Bushehr. Bushehr has been home to some famous poets. Among them are Faiez Dashti (Dashtestani) (1830-1919) and Manouchehr Atashi. Faiez poems, and dashti(or dashtestani) literature in general, resemble Baba Taher's works. Sadeq Chubak and Najaf Daryabandari are among the most prominent writers in literature of Bushehr. Wikimedia Commons has media related to Bushehr Province.